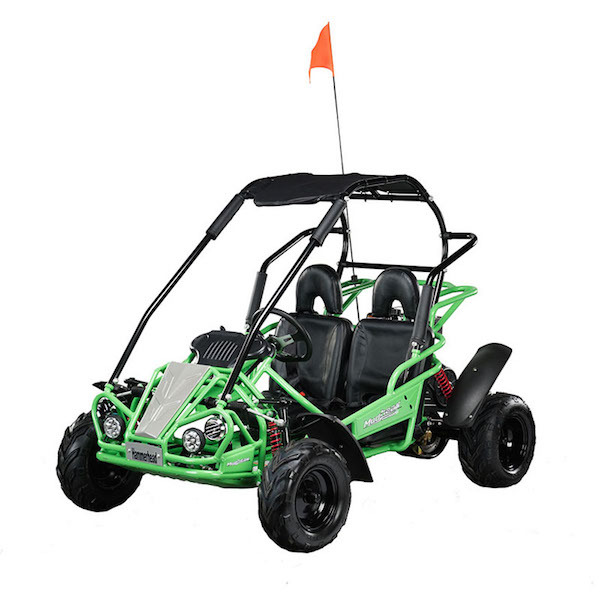 The MudHead 208R is the newest addition to our fully equipped youth segment karts, and the perfect way to get your family across your large property both quickly and efficiently this coming fall and winter. As the temperature begins to drop, it becomes progressively harder and harder to stay inside because the weather is too perfect to avoid. Your children will dread having to come back into the house at the end of the day because they’ll be too busy enjoying activities outdoors, and you will want to get out there and join them in welcoming the change of seasons. This is where Hammerhead’s MudHead go-karts come into the picture! These go-karts are the perfect way to let the children loose in a vehicle that can bring a thrill in a way that parents can trust. The MudHead 208R comes equipped with an electric-start engine and manual choke that is intended for all-weather starting, a feature that makes a big difference in a child’s ability to operate a utility vehicle. With an adjustable driver’s seat and a throttle governor in place, this go-kart is easily transitioned between drivers with varying amounts of experience. Now available in six different colors, this go-kart makes the perfect choice for the large family who may be in the market for buying multiple karts that can keep all the kids busy at the same time. With cooler weather ahead and many fall-themed activities on the radar, you won’t want to miss out on the chance to invest in a fun-filled way to get around your property or over to your neighbor’s house. From game day tailgate parties to last minute bonfires to a Saturday full of just watching your children play outside and enjoy the beautiful outdoors, this MudHead is the much needed solution to adding fun and efficiency to both your life and that of your child. Visit us today to learn more about our high-quality off road vehicles and the many ways in which you and your family can benefit from owning one of your own! Shopping for Off-Road Go Karts?